Right next to the jewel of Romanesque art that is the abbey church lie the convent buildings housing the nuns’ cells. The first-floor cells have been converted into hotel rooms and now offer you original nights and an intimate feel for the abbey. To access the cells, you must ascend the magnificent stone staircase and take a long, vaulted corridor. The shell-white stone, original floors, beautiful vaulted ceilings and intended minimalism set the tone for the night. No television here, and the facilities are on the landing for most of the rooms. 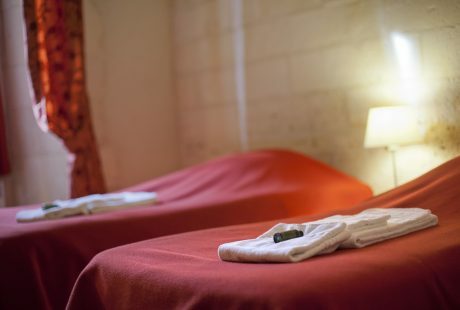 We offer a special brand of asceticism so you can enjoy the essentials: quiet, serenity and soulfulness. 33 rooms open onto the courtyard and garden. Prices start at €45 a night. Les Chambres de l’Abbaye Hotel has a “bike shelter” label. Saintes is home to La Flow Vélo, a new, national cycling route spanning 290 km, which connects Thiviers in the Dordogne to the Ile d’Aix in Charentes. We have a secure building for your bikes. 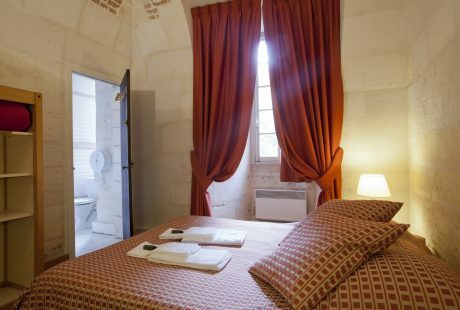 At the heart of the Abbaye aux Dames, la cité musicale, our rooms are former nuns’ cells converted into hotel rooms. They are on the first floor of the convent building. With an understated décor and gorgeous construction (cross-vaulted ceiling, original floor, white stone), this room has two single beds. The bathroom is right next to the room, down the corridor. The tourism tax is not included in the price. 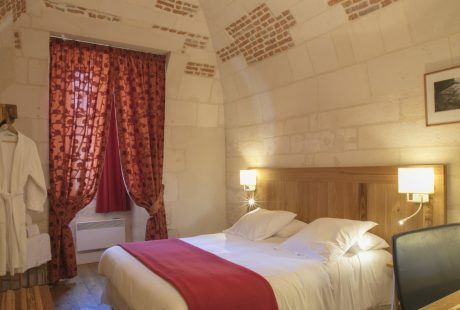 At the heart of the Abbaye aux Dames, la cité musicale, our rooms are former nuns’ cells converted into hotel rooms. The rooms are on the first floor of the convent building. With an understated décor and gorgeous construction (cross-vaulted ceilings, original floor, white stone), this room has one large bed. The bathroom is right next to the room, down the corridor. 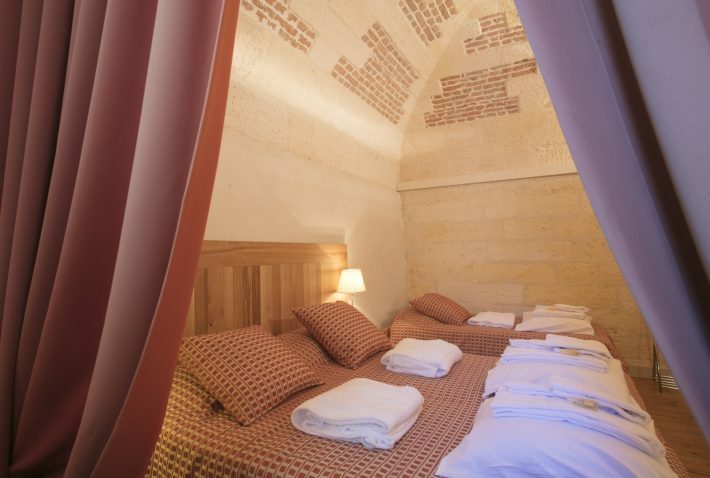 At the heart of the Abbaye aux Dames, la cité musicale, our rooms are former nuns’ cells converted into hotel rooms. The rooms are on the first floor of the convent building. With an understated décor and gorgeous construction (cross-vaulted ceiling, original floors, white stone), this room has one large bed and an en suite bathroom (sink, shower and toilet). At the heart of the Abbaye aux Dames, la cité musicale, our rooms are former nuns’ cells converted into hotel rooms. The rooms are on the first floor of the convent building. With an understated décor and gorgeous construction (cross-vaulted ceilings, original floors, white stone), this room has one large bed and one single bed. The bathroom is right next to the room, down the corridor. At the heart of the Abbaye aux Dames, la cité musicale, our rooms are former nuns’ cells converted into hotel rooms. The rooms are on the first floor of the convent building. 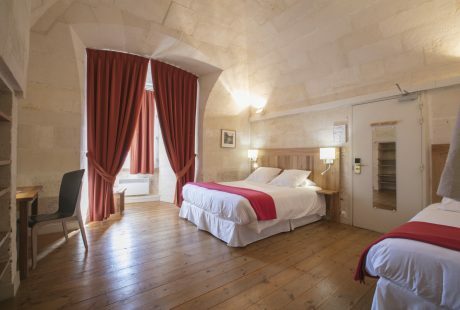 With an understated décor and gorgeous construction (cross-vaulted ceilings, original floors, white stone), this room has one large bed measuring 160 cm x 200 cm and two single beds. The bathroom is right next to the room, down the corridor.